Rode with a loosely organized group to the edge of civilization at White's Hill where as usual the group broke into smaller pieces with me towards the back. I was in no hurry. By the time I was near the next climb, Wilson Hill, I was riding with Phil M who I have never formally meet but have seen on brevets before. Phil and I are part of a Fleche team which will run next weekend so it was nice to chat a little with him. Also riding somewhat near us was Todd T and another rider which I forgot his name. The four of us leapfrogged our way for a while over the gentle terrain of Chileno Valley Rd and towards the end joined another group of riders. The larger group moved a little faster than me and within a few miles they disappeared over a hill. I rode alone to the first control in Bodega. The Bodega Country Store was busy with randonneurs getting their proof of passage, many familiar faces there. After a pickle a chocolate truffle thing and water (adding a dose of malto-dextrin) went outside and found Eric W doing his own nutrition thing. Eric is also part of our Fleche team and we have ridden together many miles before. We left together and climbed Joy road where Robert J (I think) joined us. 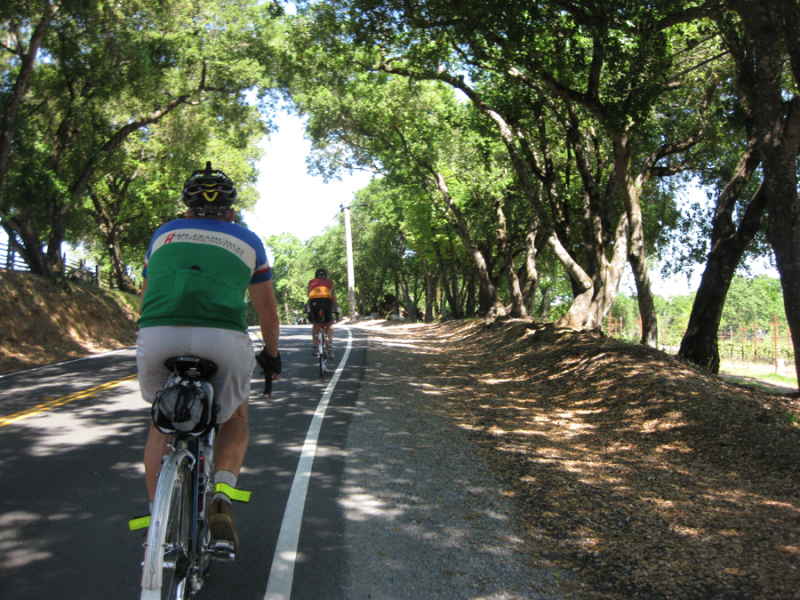 The three of us rode more or less together to Guerneville the next control. Soup, water with more malto and a little rest. I was ready to roll and so was Eric; Robert joined us. The sun was out and temperatures were higher that when we arrived in town. On the way to Healdsburg we rode on a larger group lead most of the time by Tim W. on his recumbent. It was hot now. Eric had been riding strong till now. At a point when the larger group was spreading out I looked back and could not see him, I slowed down and in no time we were riding together. He was having cramp issues and his salt/electrolite pills where not handy so I shared some of mine and that did the trick. We catch up with the group and then rode the last 20 or so miles to Cloverdale together. After a stop at the gas station in town where we had a slurpy and a bunch of junk food we got moving. The most pleasant section of this ride (IMO) was just a few miles ahead. Mountain House Rd did not disappoint with its scenic screaming descents and climbs. I was not feeling that strong but knew the next controls was near. At Hopland there were not many bikes (any that I can remember) when we got there. We got a beer and slice of greasy pizza and sat inside to enjoy our lunch. eectronic gadgets got charged while we replenished out own batteries. More riders arrived and soon we had a conversation going as the clock continue to move. This stop was looong but a needed rest recharged us when we where ready to go. Again we rode is a semi-organized group but by Geyserville the effort we had put took its tool and we need another rest and more importantly water. After hanging outside the store for a while the next group of riders showed up. We left and saw not much traffic on hwy 128. This segment can get busy on weekends when gamblers drive to the casino a few miles ahead. Other than a couple of cars passing too close there were no big issues. Chalk Hill was next. Different riders stop while climbing the hill, it was just getting dark now. I proposed to stop a the top but was in the minority and since was not feeling particularly strong I kept on going and stop at the top to put my night riding gear on and a few extra layers. Eric and Robert joined me on the descend. Robert commented on how bright my rear Magnic Lights were on the descend, almost too bright. Flat boring miles went by slow, the monotony broken by a flat tire that was repaired on the side of the road. A few riders went by while we were stopped. 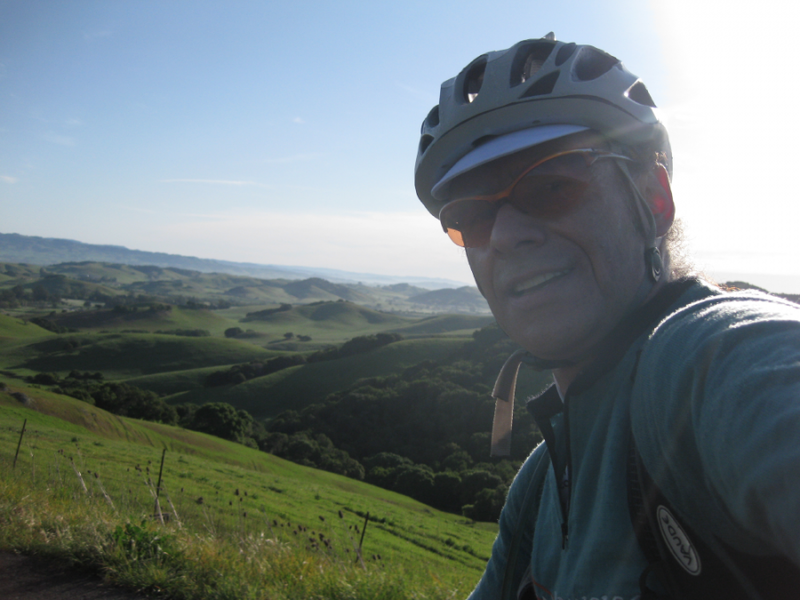 It was getting cold now and there were many more flat miles before our next control in Petaluma's Safeway. When we made it to the Safeway there were plenty of riders and bicycles inside and out of the store. Some did not looked too good. I was feeling better now but as usual when I get here on this ride I wanted to get out of there as quickly as possible and finish the ride. Eric and Robert were enjoying their food break so I relaxed and forgot about time. We left and it was now much colder, or I should say it felt much colder outside after being inside the store for a while. 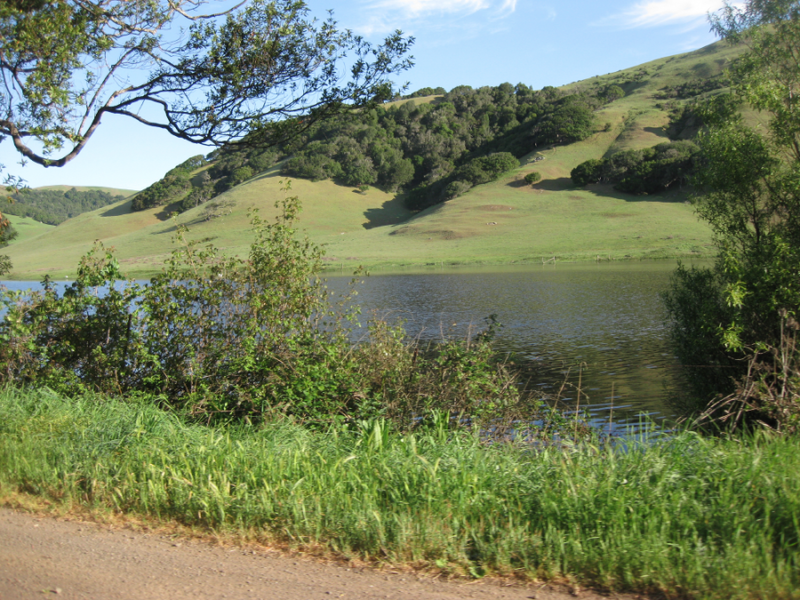 Climb that Red Hill and then rode the rollers to Nicasio where a new control was waiting. This was a new control in this route. A few weeks before I had mentioned to Rob, our RBA, that there was a new way to ride from Petaluma to San Francisco which cut the climbing and also a little bit of the distance compared to the regular route we take o most brevets; I think that triggered the need for a new control in Nicasio. We looked for the Informational Control for a couple of minutes until we found a nice home made sign that contained the information we needed to answer the Info Control question. That was it, the home stretch to San Francisco! On the San Geronimo Valley we lost Robert but he rejoined us near Fairfax and we flew the miles to Ross and Larkspur. 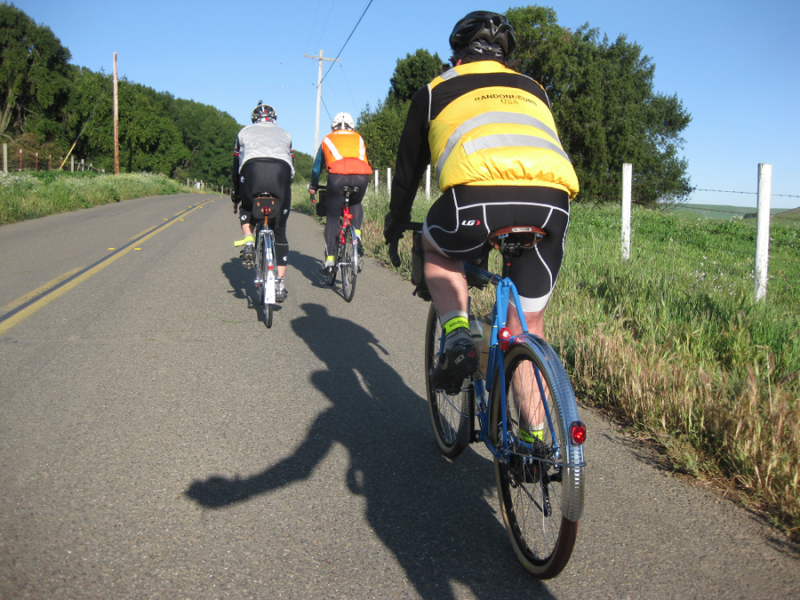 At Camino Alto we saw another trio of riders and climbed just behind them. Cold still. Sausalito traffic lights consolidated the two into one group but the last hill to the Golden Gate Bridge broke us apart again. At 3:03 am we were signing the final control sheet. Junk food, some conversation and then rode the last few miles home. After this 400k I felt I did not want to ride another brevet for a while. Next weekend I am committed to the Fleche but after that my commitment to the 600k is on the air and I anticipate a spike on work so it is likely I won't ride the 600k.